'Mythical Beasts' features feathered serpent on Science Channel – AiPT! The fifth episode of Mythical Beasts, airing tonight on Science Channel, takes an in-depth look at the legendary feathered serpent of Central Mexico’s native people. The feathered serpent is presented as a spiritual symbol with access to the heavens, underworld, and the human world in between. 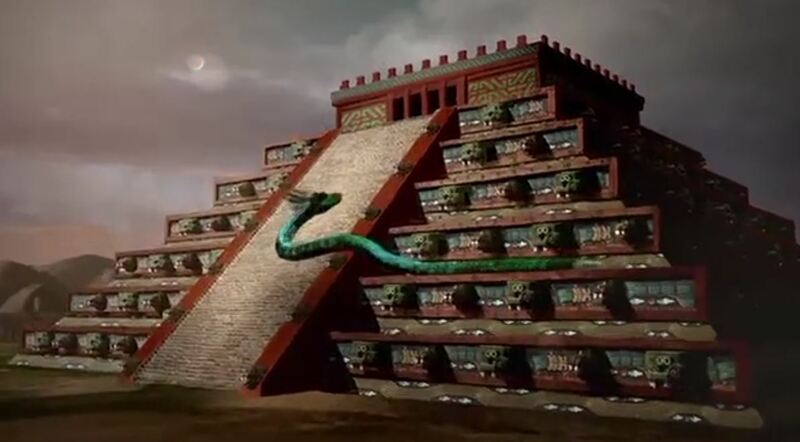 The episode centers around the Mesoamericans of Teotihuacan, but acknowledges that the feathered serpent story is found in other places in Mexico, especially in the Mayan and Aztec civilizations. It follows the work of archeologist Sergio Gomez Chavez and historian Annabeth Headrick to search for evidence of the origins or existence of the half-snake, half-bird creature known in Teotihuacan as Quetzalcoatl. The first part of the episode provides the biological basis for the feathered serpent. The quetzal is a bird with vibrant plumage and males can have a tail feather upward of three feet in length. It’s plausible that the tail feathers may have appeared serpent-like. Coatl, though not mentioned in the episode, carries the meaning serpent. Comparative anatomist Joy Reidenberg believes the snake was seen in a supernatural light due to shedding its skin and appearing renewed. Reidenberg also believes the rattlesnake may lend itself to the role of the serpent in the myth due to the deadly nature of their venom. Mythologist Winnie M. Li agrees, noting the rattle of a rattlesnake was thought to mimic the sound of rain, and therefore was symbolized as the bringer of water for the crops of Teotihuacan. It’s no surprise that snakes would be revered by the ancient peoples of Teotihuacan. Classicist Karen Hersh points to other cultures in Europe, saying it’s almost as if ancient peoples worshiped the things they feared. Snakes were believed to be from the underworld, but also acted as guardians or protectors. A mythological creature of Rome named Medusa is thought to offer clues as to how the fear of snakes might be overlooked in order to harness their power. She boasts hair of snakes and an ability to turn people into stone with her stare. A hero named Perseus severs her head and is able to wield it as a weapon, turning his own enemies to stone. Ioulia Tzonou-Herbst is an archeologist in Greece who explains why the Romans held strongly to the image of the severed head of Medusa. The symbol represents not only power, but also protection from harm and is a provider of strength to defeat any obstacle. The symbol of Medusa was widespread, from ancient coins to a ring that wards off disease. It was even found on the armor Roman soldiers wore into battle. A huge pyramid temple stands in Teotihuacan, with serpent heads carved into the facade. Historian Annabeth Headrick studies the structure and finds that it originally would have had 260 carvings. She explains that number was significant to the ritual calendar. Upon the back of the carved serpent sits the headdress of nobility, meaning the feathered serpent wasn’t just revered, it was divine. The serpent temple sits in the center of the massive ancient city of Teotihuacan. A hole opened up and brave archeologist Sergio Gomez Chavez dropped down inside to discover a tunnel underneath the structure. Inside was a miniature, crafted landscape with four greenstone figures facing upward toward the ceiling. Pyrite was pressed onto the ceiling to mimic the stars, and mercury pools once laid in the landscape to represent lakes. Chavez believes the chamber was once flooded to represent the underworld, where the serpent would have preferred to live. He believes this is the genesis story of our universe as the people of Mesoamerica believed it, that the serpent created this plane of existence between the underworld (water) and the heavens (sky) with just one thought. The land where Teotihuacan was built was the axis mundi; the feathered serpent had grown it from the sea and could now pass freely between all of the spiritual planes. Upon excavation, evidence of human sacrifices were found. Headrick and Chavez discuss the purpose of sacrifices and the effects it may have had on the political structure of Teotihuacan. Three of the pyramid,s sides show signs of a stuggle, but Headrick doesn’t think it was from an outside invasion. Instead, she believes it’s likely that human sacrifices of their own people were used as a cure for drought and poor crop growth, and that may have caused an internal uprising. The temple was not completely destroyed, which leads her to believe that the people were angry at their rulers, not at their god. Even after Teotihuacan lay in ruin, the feathered serpent still held meaning and was honored by more temples across central Mexico. Temples to the mythical creature can be found in Chichen Itza, Xochicalco, and at The Great Temple of the Aztecs. It’s concerning that Mythical Beasts left out the dates of the civilization of Teotihuacan (200 BC-700 BCE). There’s a lot of info about the Aztec beliefs, only stumbled upon almost a thousand years after the civilization had vanished, but there’s almost no record of the people that inhabited the ancient city of Teotihuacan, besides interactions recorded in Mayan script. Additionally, there weren’t clear definitions of which areas were homes to Aztec, Mayan, or other cultures. This is important because though they do share many similarities, their mythological stories and pantheons were a bit different. There are arguments still going on whether the Aztec people share ancestry with those that built Teotihuacan. There’s no mention of the Olmec peoples, who had the earliest known painting and sculpture of the feathered serpent, circa 1400-400 BCE. The Aztec codices weren’t mentioned either, despite showing images from them. Oddly, it wasn’t made abundantly clear that the inhabitants of Teotihuacan were their own people until very late in the airing. The actual feathered serpent myth itself wasn’t provided until midway through the episode, which threw off the balance of the show. It makes more sense to present the story first, then study biological grounds for origins, etc. Truly, this episode was not long enough to really get into the details, and it hardly nips the surface of what the feathered serpent may have meant. It was a good episode, albeit a bit out of order. It’s a great starting place to gain some information on the ancient people of Mexico. The feathered serpent episode of Mythical Beasts airs tonight at 10:00 eastern time on the Science Channel.